People talk all the time about finding their soul mate. This article will tell you exactly what to look for in a soul mate and whether or not you have actually found yours. How many times have you heard someone say, “I’ve just met my soul mate,” or “We’re soul mates?” And how many times have you heard these same statements repeatedly coming out of the mouth of the same person but in reference to each new man she meets? How could she possibly have so many soul mates? And if a particular man is truly her soul mate, why aren’t they still together? Surely, it isn’t that easy for the average person to meet their soul mate. Or perhaps it’s the easiest thing in the world when the time is right and their paths are destined to cross. One thing is certain, you cannot jam a square peg into a round hole and declare to the world and anyone else who will listen that, “This time, I’ve really met my soul mate — no, for real!” Unfortunately, no matter how much you may yearn for this to be true, your yearning does not make it so. Sometimes you see two people, a couple, who just seem so right for each other.They appear to go so well together.They fit — naturally — seemingly without effort.And you say, "What a wonderful couple! "Do you meet such couples all the time, once in a while, or rarely?And if your answer is rarely, why?What does it take to make a wonderful couple who share a special connection beyond that of most couples? Is this what it is like to find your soul mate? There are some fundamental things thatsuch couples will usually have going for them, often without realizing it. First and foremost is mutual respect. Mutual respect has absolutely nothing to do with traditional or defined gender roles.It is the acknowledgement and appreciation of two beings for each other.If a woman is with a man whom she doesn't respect, doesn't look up to, who doesn't shine for her in her life, she will not want to reflect his energy.However, let us also bear in mind that a woman can and must still shine on her own, as an individual, apart from the relationship.If she does not want to reflect his energy, then she will be reluctant or even refuse to assume the role of the female in the relationship. That means the man will be relegated to the female role. This will not be discussed necessarily or even admitted to by the participants but the relationship dynamic between them will reveal it.In every relationship in accordance with Mother Nature, someone must assume the male role and someone the female role. With humans, role reversal is a possibility. We’ve all seen it many times with various couples. A male frog on the other hand will only ever behave as a male frog. And the female as the female frog. This applies widely in the animal kingdom but not necessarily in the human realm. In order to grasp this principle of reflective energy more lucidly, let us look to the universe for our model.Throughout history and various cultures, the sun is widely regarded to represent the male principle while the moon symbolizes the female principle. As the feminine moon reflects the light of the masculine sun, the female in relationship must be inspired to complement her male partner.She must look at him with respect, admiration and love. On another level, it is true that they should ideally complement each other.Conversely, in what circumstance have you seen the sun reflect the light of the moon?Further, the earth and the moon are both regarded in all ancient traditions as female.The moon revolves around the earth, but both earth and moon revolve around the sun, the logos, the male celestial principle.These fundamental laws have been demonstrated in nature since the beginning of time.To deny them or to minimize them is to ignore or not recognize the workings of the macro-cosmos and how it is a model for the micro-cosmos or our day-to-day lives. How can a woman have found her soul mate if she is not inspired to reflect his energy? Men are attracted to women and women are attracted to men from a fundamentally physical or sexual point of view. A man wants to instinctively mate with a person who has female body parts as well as female mannerisms and characteristic feminine behavior. And vice versa for a woman. This is nature. But why did you choose to come into this lifetime as a male or female?What did you want to learn and what desires did you hope to fulfill?A man may need to learn how to treat and deal with women.A woman may have to gain an understanding regarding men and how to successfully interact with them.A woman may want to embrace the joys of motherhood. A man may need to learn to accept the responsibilities of fatherhood.A woman may need to make inroads into careers that have been traditionally male-dominated, such as aviation, engineering or film directing. This is the first level of true relationship recognition — gender identity. Although gender identity and body parts will be enough to define and determine most relationships for the vast majority of people, there are actually two other considerations of greater importance if one wants to truly find one’s soul mate. The second level is to see the actual individual who inhabits that body.And the third level is to recognize the soul encased within that body. Ironically, most people never get this far in their search for a soul mate. The second level is that of the individual or individual ego.On this level, there is the need to discover and affirm the purpose that a particular human has come here to realize and to accomplish in this lifetime.This purpose must be pursued in accordance with one’s particular nature in this life.It could be anything under the sun, such as to teach, to lead, to invent, to heal, to protect, to advise others in finance, to repair automobiles, etc.It must satisfy the individual’s basic nature or natural inclination and it must provide a needed service to others. In order to see this accurately in terms of your partner, you must see beyond gender and actually see the human being underneath.This particular soul has chosen a human body in this lifetime.It has human needs, hopes, dreams, weaknesses and fears.These too must be given consideration in an objective manner, not from your point of view with regard to your needs, but from the subjective needs of that person, without the imposition of your needs. Thirdly, the soul.We find the soul, which is wholly comprised of spirit, within the body of each living being, no matter the species.All have a soul.The common purpose of each soul is to evolve, to become more conscious, more aware, to work its way up through some of the eight million various species until it achieves the human form.The human form is the highest form because it endows the soul with a level of intelligence and discrimination that is not available to animals which are governed by instinct alone.In the human form, the soul’s purpose is to realize its eternal nature and its eternal relationship with God, the Creator.The eternal nature or sanatan-dharma of the soul is to act in harmony with the Divine Will or the Universal Plan — to be of service to the universe. Each soul is on a journey from lifetime to lifetime, gaining experience, awareness and consciousness.There must be respect for and acknowledgement of that soul and its journey in this lifetime. Another way to look at this is analogous to the three stages of water.The physical body itself or the gender identity is the most dense, like ice. The individuality is less dense, like water. And the soul itself is the most subtle, like steam.Persons who are looking to find a soul mate must become aware of these three states of being and be willing to acknowledge them in anyone whom they are considering as a potential mate. Earth-bound means the relationship begins from the lower elements and is moved upward in the direction of the apex of the triangle. Heaven-sent means the relationship begins from the higher elements and is moved downward in the direction of the apex of the triangle. When relationships begin from the lowest element, earth or the physical connection, they must be moved upward to the higher categories in order to expand, strengthen and maintain the bond. If that is not accomplished, the relationship is established as an earth-bound connection, that is, it is effectively influenced by gravity. Gravity tends to drag things down or pull them apart. It is harder to raise a relationship up beyond the physical than it is to establish the connection at a higher rung on the ladder and have it move downward to the other categories. In other words, the higher the connection to begin with, the better the relationship is likely to be. 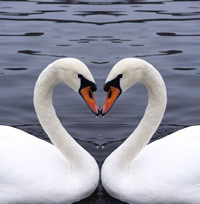 If you have a bond with your mate that is primarily intellectual, that is, you are stimulated by each other’s minds and your ability to communicate, then it is much easier to move your connection downward to the lower elements because your relationship has already been established at such a high platform. In this case, the only thing that must be reached for is the spiritual connection. The rest of the elements are beneath the intellectual level and therefore much more easily achieved. You yourself may know that if someone experiences a bond of friendship with another person which later becomes an intimate relationship, that that proves to be a much stronger connection than the other way around. Souls with the highest bond, the ether or spiritual category, would likely have a mission or higher purpose to accomplish together down here on earth. And that is why they have come together in this lifetime. This would be the highest expression of the heaven-sent concept. A couple whose bond is primarily spiritual but who have no particular mission for the masses may simply embody an evolved spiritual connection in their relationship. Their union would be an example for others to learn what a loving relationship of such a high vibration can be. A mission can consist of charitable, philanthropic, altruistic or spiritual work for the benefit of some group of people. This higher purpose can also be the giving birth to souls of higher consciousness who will affect the masses on a large scale through the arts, discoveries, inventions, innovations, world politics or literature, for example. These souls look for wombs in which to take birth among families of higher consciousness. In the Bhagavad-Gita, the "Song of God," Krishna (God) tells Arjuna that high souls who have spent past lives developing their conscious awareness or relationship with God are born into three kinds of families — virtuous people, wealthy people or spiritual people. In these circumstances, they are again given an opportunity to renew their efforts toward freeing their souls from the cycle of samsara, repeated birth and death. You may ask, why wealthy families? When you are born into a wealthy family, there is little or no struggle required to earn a living. The fundamental economic problems have been solved. You are free to pursue loftier goals. However, this does not mean that all wealthy people are high souls. Relationships which come together almost magically, wherein the partners are strongly matched or get along very well, where conflict is conspicuous by its absence, where both partners are positively and regularly affirming each other, where the bond of loving affection defines their daily interaction are heaven-sent relationships. Once a person has successfully found her soul mate, will the actual relationship turn out to be as wonderful as she has fantasized and proclaimed it to be? Not always. Can it be the relationship of a lifetime? It usually is but not always in the way she hoped for or wished. For purposes of clarity, I am going to divide the concept of soul mate into two categories: 1) the karmic soul mate and 2) the karma-free soul mate. The romanticized or idealized notion of the soul mate typically referred to by the masses is the karma-free soul mate. Both types of soul mates have almost always had past life connections with the soul with whom they are reconnecting in the present lifetime. That is why the bond is so powerful and compelling when the connection is reestablished. It’s almost as though you have no choice in the matter. You have to be with this person. In fact, in some instances, the renewed relationship is indeed predestined. It was agreed upon by both parties before coming into this lifetime. I know a woman who began her first day of school in a brand new school in the 11th grade. She was sixteen years old. As the students filed into the classroom, a boy walked in to take his seat. The moment she laid eyes on him, she knew that he would be her husband later in life. They married at age twenty-three. I know another couple who were able to trace four previous lifetimes spent together.In three previous lifetimes, they were married to each other, one as Eskimos and one as a poor couple in Eastern Europe. And in the fourth lifetime, they were both Buddhist monks living in Tibet and were the best of friends. Many times, people will meet a new man or woman. They feel instantly comfortable with this person. It is as if they have known this person forever. He seems so familiar yet the two have just met. They immediately click and discover their common interests and other coincidental connections. One seems to know what the other is thinking and can often finish the other one’s sentences or thoughts. They can sit quietly without conversation or the need to speak and artificially fill the silence. The silence can be welcomed, peaceful and comfortable. They just enjoy being together. There is no need to ‘talk at’ each other. These two souls in actuality already know each other. They have been together before in previous lifetimes. They may now be ready to ‘pick up where they left off.’ This is one way to determine if a potential soul mate is now appearing in your life. Let’s begin by talking about the karmic soul mate. The karmic soul mate has had a past life connection with you. But something remains unfinished or incomplete. And you are being given yet another opportunity to clear up this karma and learn the lesson that it is meant to teach. Sometimes it is a case of karmic retribution. The other soul will get the opportunity to pay you back for something you did to him in a previous life. In my Guided Healing Meditation work with clients which I have done for more than nineteen years, I have seen an example of a man whose wife left him for another man in this lifetime. When we investigated the deeper subconscious reason behind his victimization, we found that he was with this same soul in a previous life and that she left him in that lifetime as well. In this case, the lesson that he needed to learn was to stop putting himself in the role of the victim. As such, he unconsciously looked for someone who would assume the opposing role of victimizer and subsequently take advantage of him. In this way, he remained firmly entrenched in the victim mode. His wife was a karmic soul mate since she returned from another lifetime to help teach him a lesson he needed to learn which remained unlearned from his past life. Through Guided Healing Meditation, I discovered a male client had been a woman in a past life who abandoned her baby. In this life he was abandoned by his mother when he was a baby. The soul of his mother in this lifetime turned out to be none other than the baby from the previous lifetime whom he as the mother had abandoned. This was a simple case of karmic payback. This example is not necessarily one of soul mates, but illustrates how souls reconnect with each other for karmic purposes. Karmic soul mates are teachers of important lessons. In many instances, time goes by while the lesson remains unlearned. The person will not let go of the relationship even though it is producing suffering or sorrow since she still has not learned the lesson. It is important to point out that they may be simultaneously teaching each other what needs to be learned. When the lessons are learned, it is usually time to let go of the relationship and move on. Sometimes people do just that. But in some cases, they won’t let go. They may stick around and generate more karmic reaction. Or they may become stuck in the past and won’t let go until the other person pays what they believe is owed to them. A karmic soul mate feels more like a negative connotation of the soul mate phenomenon. But it is, nonetheless, a soul mate who is spending his time helping you to learn a difficult lesson that you are afraid to face or may not want to learn. Remember that your karmic soul mate is usually instrumental in teaching you one or more of the most difficult lessons that you will face. I know a man whose first marriage was with a woman who was a karmic soul mate. In many ways, they were on a similar wavelength, especially spiritually and ideologically. Spiritually, they felt their collective purpose was to bring children of higher consciousness into the world which they were blessed to accomplish. But the relationship was in some ways co-dependent. The man chose to move on rather than to continue with their collective karma and deal with the issues within the bounds of that relationship. He didn’t have the commitment to his partner which he needed in order to summon the determination to carry on. In retrospect, he felt he had made the right choice and has since found someone with whom he feels more connected and committed to than ever before in his life. A soul mate relationship is a god-send, even when it may be a struggle to realize the karmic lesson it is meant to teach. The karma-free soul mate is the one that is romanticized and prayed for by the true believers. These matched souls are there to love, help and support each other through life’s travails. They are the ones who believe in their partners and their dreams and joyfully offer inspiration and encouragement no matter what occurs. The difficulties in their lives are not caused by each other but by outside forces and other persons and circumstances. If your mate is the cause of some of your biggest challenges in life, then he is not your karma-free soul mate. Karma-free soul mates do not put their own needs above those of their partner. The needs of both partners are equally important. How many times have you heard or said this, "You have to work at a relationship." More than you can count, I am sure. Is this true? It is definitely true in the average relationship and also in the karmic soul mate relationship. However, it is not the case in a karma-free soul mate relationship. You do not have to work at it. The only requirement is love and the expansion of the love between you. There are no significant karmic lessons that must be dealt with or overcome in such a circumstance. So the next time you tell a friend about your relationship and then say, "You have to work at a relationship," and your friend nods knowingly, you can safely conclude that neither of you are in a karma-free soul mate relationship. How do you know when you may have met your karma-free soul mate? Beyond gender identity and recognition of the individual, you actually love the soul inside. You aren’t wholly concerned with yourself and getting your needs met. You are actually committed to the evolution of the soul who walks by your side. You pledge to help that soul realize his life purpose. Real soul mates love each other unconditionally. We sincerely hope that this has brought greater clarity with regard to recognizing your soul mate.In order to attract a soul who is on a higher level of consciousness, you yourself must be genuinely vibrating on that same level. For like attracts like. And a soul mate will come to one who is acting like a soul and not simply reacting on the level of a male or female gender identity.